Capt. Richard McGuire, of Loretto, commanded a company from Cambria county in the war of 1812. An examination of the roster discloses the names of many families who now reside in the northern part of the county, namely: the Burgoons, the Coyles, Daugherty, Delozier, Elder, Gallagher, Glass, Lilly, Magehan, McGough, McGuire, Nagle, Troxell, Weakland and Will. The first call for troops was made by Governor Snyder, May 12, 1812, and Capt. McGuire recruited his company in June and July. He marched to Stoyestown, and there, on September 13, it was assigned to the First Brigade, under Gen. Jacob Saylor, of Somerset, subsequently led by Gen. Tannehill, and in the Twelfth Division, commanded by Maj.-Gen. Alexander Ogle. It was a part of the First Battalion of the 142d Regiment of Infantry. 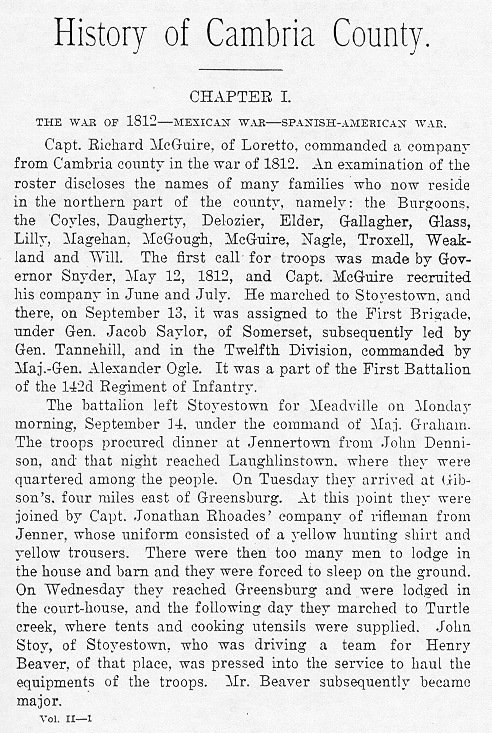 The battalion left Stoyestown for Meadville on Monday morning, September 14, under the command of Maj. Graham. The troops procured dinner at Jennertown from John Dennison, and that night reached Laughlinstown, where they were quartered among the people. On Tuesday they arrived at Gibson's, four miles east of Greensburg. At this point they were joined by Capt. Jonathan Rhoades' company of rifleman from Jenner, whose uniform consisted of a yellow hunting shirt and yellow trousers. There were then too many men to lodge in the house and barn and they were forced to sleep on the ground. On Wednesday they reached Greensburg and were lodged in the court-house, and the following day they marched to Turtle creek, where tents and cooking utensils were supplied. John Stoy, of Stoyestown, who was driving a team for Henry Beaver, of that place, was pressed into the service to haul the equipments of the troops. Mr. Beaver subsequently became major.